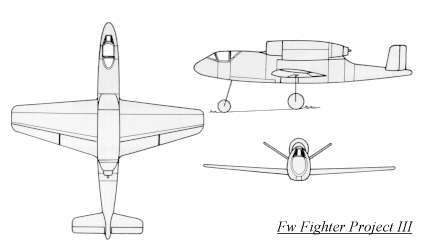 Continuing the Focke-Wulf early jet fighter designs, the P.III is also known as the P.II (dated December 22, 1942) in some references. It had a straight wing with a more pronounced taper on the trailing wing edge than the leading wing edge. The jet engine was located on top of the fuselage just behind the cockpit (like the Heinkel 162), and exhausted over the V-tail. 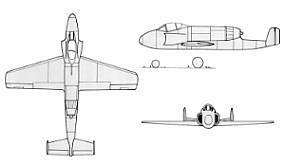 A tricycle undercarriage was fitted and the armament consisted of two MK 108 30mm cannon and either two MG 151/15 15mm machine guns or two MG 151/20 20mm cannon.